Crispy Green: Crispy Fruit Big Game Giveaway!!! We are football fans around here – San Diego Charger fans. My husband is a born and bred fan, and there was no other team to root for when he was growing up – it is his DNA! Since we are fans that rarely see play-offs, we choose to watch the game in a more passing fashion, but we partake in the snacks. This year we are taking the snacks we love, and exchanging them for variations of things we love. 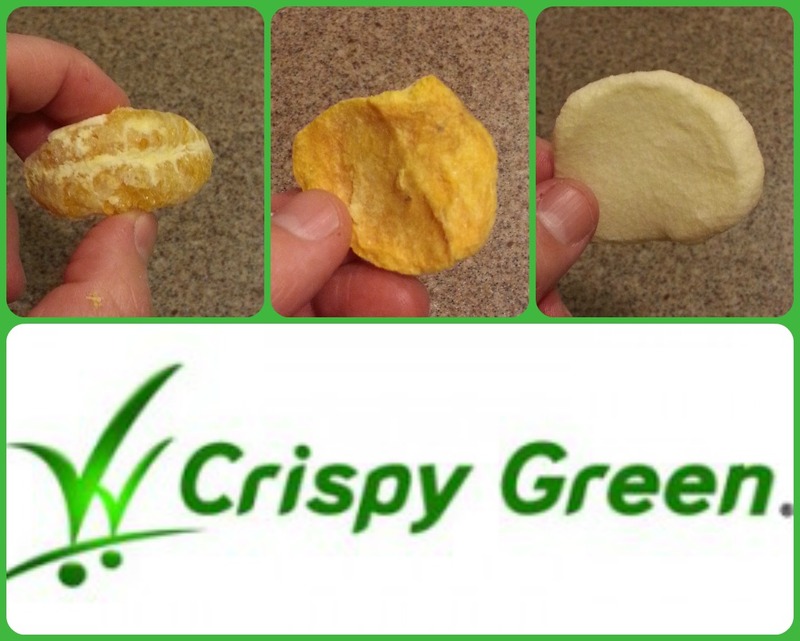 Back in July of 2015 I reviewed a company called Crispy Green and their product called Crispy Fruit – 7/15 review here. Crispy Green has seven flavors of freeze-dried fruit including Crispy Apples, Crispy Mangoes, Crispy Asian Pears, Crispy Bananas, Crispy Cantaloupe, Crispy Pineapples and Crispy Tangerine. I tried the Crispy Apples, Crispy Mangoes and Crispy Tangerine and they were so good I knew they would make the snack cut. I love that I can get the benefits of fruit, but not the cholestrol and fatty ingredients. Needless to say I am thrilled to have a giveaway for you, so you can have a healthy alternative on the big game day! Why wait til the contest ends, purchase some Crispy Green Now! GIVEAWAY: Crispy Green is offering a 12 pack of Crispy Fruit to my readers! (3) lucky winner’s will be selected at random to win this 12 pack assortment of fruit and each box will contain 2 bags of Crispy Apples, 2 bags Crispy Asian Pears, 2 bags of Bananas, 2 bags of Pineapple, 2 bags of Mangoes and 2 bags of Crispy Tangerines. This is a $15.58 value! I will be randomly choosing 3 people on February 1st (2/1/2016) to receive this fun & easy big day treat! Open to residents in the US only. To enter complete the entries below! Winner will be notified by me by email and prize will be fulfilled by Crispy Green! Remember you have 48 hours to claim prize, or I will choose another winner. GOOD LUCK!!! Win a 12 pack of Crispy Fruit! This post does have an affiliate link but this in no way will influence the opinion stated above and all opinions are my own. This entry was posted in Food and Drink Products, Giveaways, Gluten-Free and tagged craft snacks, giveaway, Gluten free, snack food on January 5, 2016 by Jennifer. Yes me and my family love to have a gathering with our friends and watch the game. This would be a nutritious treat to try. I don’t watch the big game. i do! love the fun, family and food! Sometimes I do, if I get invited to a party. I won’t go out of my way though. I didn’t watch the big game! No, we did not watch the big game! I try to catch it, but hard with the job I have. No, I rarely ever watch TV and I’m not a sports fan. I don’t watch the big game. I very rarely (if ever) watch television. No we did not watch the big game. I usually just watch half time. I’m from the south, and it’s all about the Clemson Tigers right now. Yes- we like to watch the big game every year. No, but my husband watches. I’m usually playing on my phone or reading, and he’ll turn around and tell me what’s happening. No, we don’t watch sports here. We don’t watch sports. We like to have Fri night movie nights and this would be an amazing treat. Thank you for the giveaway. Yes, I watch it every year. Yes, I watch the big game every year as well as the many smaller games leading up to the big one. No. We will be on a cruise. Yes we love watching it! I try to watch most of the Sunday games. We do and I cannot wait! Yes, we usually watch the big game. The “Big Game” hasn’t been on yet…so…no…but I plan to. I will be watching the BIG GAME! I don’t watch sports but my husband does. I plan on watching the big game. Yes, I love to watch the big game. Denver Broncos are going to the Super Bowl!!! I may watch it, but it elevates my blood pressure to watch games. Oh, yes I love to!